As time has shown, much of what makes a device popular is how easily it can be incorporated into an existing set-up. In the case of micromanipulators, this process has involved designing manipulator platforms that bolt directly to the frames of the most popular microscopes. Alternatively, we also offer rock-steady, free-standing platforms that support our manipulators by clamping to the table beside the microscope. Our MT-70 stand, originally designed for stable support of the fifteen pound Huxley manipulator, and MT-75 gantry-style stand, are perfect free-standing platforms for the MP-225 and MP-285. 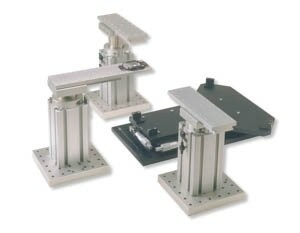 These motorized manipulators are also supported by the MD series microscope specific platforms that bolt directly to the bodies of the most popular Leica, Nikon, Olympus, and Zeiss inverted microscopes. These platforms lend themselves to the low-drift recording configuration required when using Sutter manipulators for positioning patch-electrodes onto attached cells in culture. A task-specific platform for manipulators is the MT-1000 translation system. When coupled with MP-285s or MP-225s, the system forms a slice-patch workstation. The MT-1000 was born out of a technique now common in slice recording that moves the optical pathway while keeping the slice chamber and recording electrodes fixed. The translation system allows the user to move to multiple locations on the tissue at high resolution without disturbing recording electrodes. The MT-1000 workstation encompasses: an X-Y translator designed to move a microscope smoothly and accurately; two MT-75 gantry-type stands for positioning manipulators on one or both sides of the microscope; and a third gantry stand that becomes the fixed support for the chamber. The newly introduced MT-2000 uses a motorized X-Y translator. In this design, stepper-motor driven lead screws provide smooth movement of the microscope. Our large motorized platform stages, the MP-78 and MPC-78, are perfect for multi-site experiments where the microscope cannot be translated and a wide field of view is necessary. The MT-78-FS large fixed-stage platform provides the same generous mounting surface for experiments dependent on X-Y translation.